An iconic shop; that’s what I call The Wooden Indian. 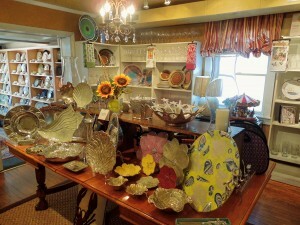 Since 1977 in our community, this shop is a representation of what shopping in Downtown Rehoboth Beach has become. First class, sophisticated, charming, exquisitively appointed, accessible to all. I remember when my children were young, they would look at me like I was from another world, as I would come into The Wooden Indian and the first thing I would say was: Touch only with your eyes. You know that look, don’t you? It worked because they never broke anything, thank God. 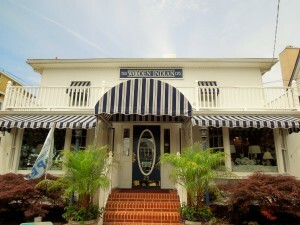 The Wooden Indian is located at 25 Baltimore Avenue in Downtown Rehoboth Beach. Tels. 302-227-8331, 800-225-8331. The website is www.woodenindianltd.com. 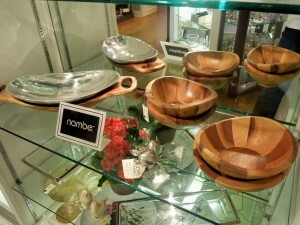 On Facebook, it can be found as Woodenindian Rehoboth. That might be your best best as you will be able to follow updates and what’s coming new into the store. This is the second season for Paul and Joseph, the proprietors. Under their creative strengths, The Wooden Indian has acquired a modern simplicity that I noticed as I came in. 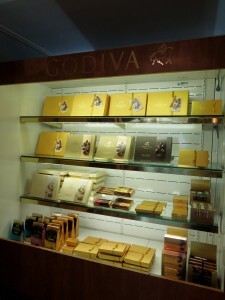 You can move through the store with ease; every item is beautifully displayed. 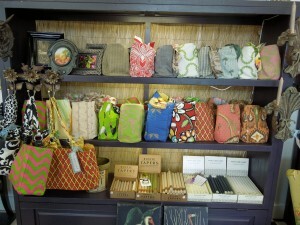 One person that is key in this shop is Frances. I think she has seen the beginnings, the ups and downs of the store and the resurgence of what The Wooden Indian represents at the Delaware Beaches. 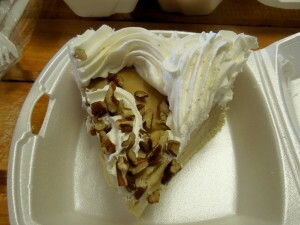 Rehoboth Beach is a very walkable town and The Wooden Indian is one street north of Rehoboth Avenue. The Wooden Indian is still there as you come into the store; to the left. 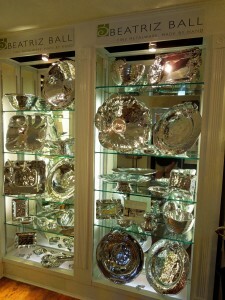 Well known brands are Lynn Chase, Waterford, Herend, Godiva, Royal Copenhagen, Beatriz Ball, Vietri, Nambe, and Vera Wang, among others. The shop will wrap and ship. Baskets can be made for presents. 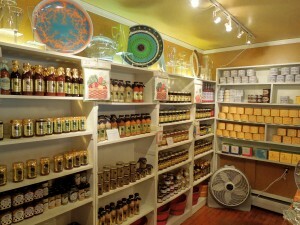 A variety of preserves, peanuts, sauces, and dressings. 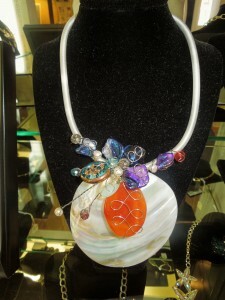 A new line of jewelry by designer Esther-Ann Ingram, an independent shell artist arranging shells into beautiful works of art. 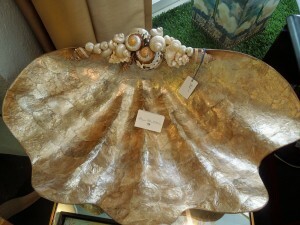 One of a kind pieces; the shells come from all over the world. 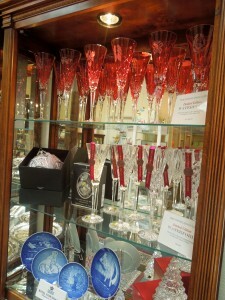 The Bridal Registry is an integral part of the traditional wedding preparation. 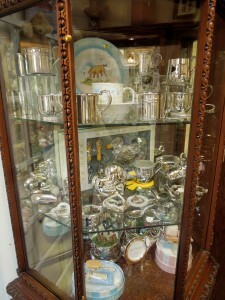 The Wooden Indian has china, crystal, silverware, and plenty of gifts in a wide variety of prices. It is a special time of the year. Plenty of weddings during the summer months. The beaches are an attraction for that special day. And, for the new addition to the family, they also have presents, as well. 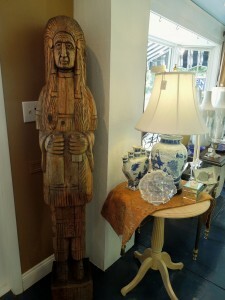 The Wooden Indian is part of Rehoboth Beach….talk to you later. My car had not forgotten where to go. For so many years I had traveled up and down Coastal Highway (Rt. 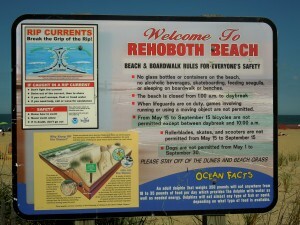 1) from, Bethany Beach, where I first lived, and later from Rehoboth Beach. The back roads have always been my favorite. It is where you can really enjoy the beauty of the area I call home. Friends from out of town. Great opportunity to show them here or there. Today was a road trip from Rehoboth Beach to Berlin, Maryland, in Worcester County. 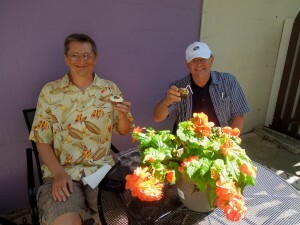 Jim and Basil had already hit the Farmers’ Market in Rehoboth. Please don’t eat there I told them. I am taking you to a special place. Em-ing’s!! If you have been there, then you know I am talking about great barbecue. Homemade desserts and breads. They are located on the corner of Rt. 113 and 610 in Bishopville, MD, just after you leave the town of Selbyville, Delaware if you are going south. The tel. is 410-352-5711. Website? 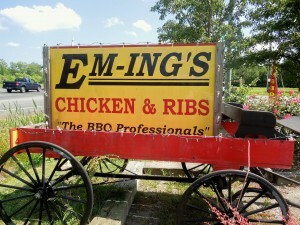 www.em-ings.com. It was great seeing Robin. We have only talked by e-mail. I wrote a post on Em-ing’s back on January 22, 2011. If you want to see it just click on the month of January, 2011 on the left hand side of this website, and scroll down to the 22nd. I think Jim and Basil were very happy with their choices. This is what we all had. 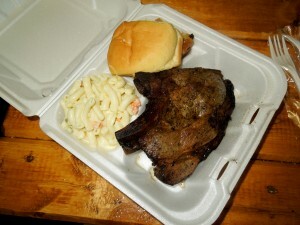 Jim ordered the Country Rib with a side of Mac, salad, bread and butter. It also included a homemade pie. He chose the peanut butter. I have to tell you that he ate it all. 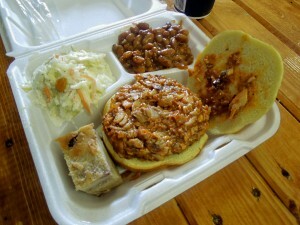 Then, Basil had the pulled barbecue chicken sandwich with cole slaw and baked beans. I know he, definitely, enjoyed it. I decided to have the beef barbecue sandwich. 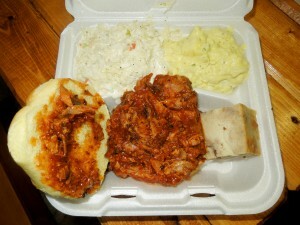 At Robin’s suggestion, with a side of cole slaw and potato salad. Perfect suggestions, Robin. It was delicious, as usual. 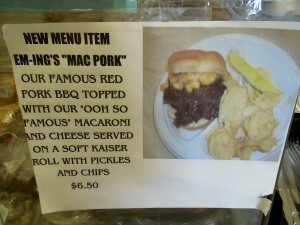 Soooo satisfied, it was time to move to the town of Berlin, Maryland, but not before you see the latest addition to their menu. 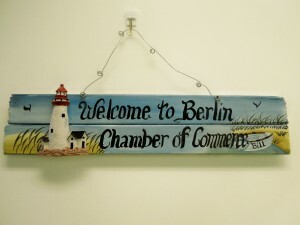 We decided to stop at the Berlin chamber of Commerce and Visitors Center located at 14 South Main St., Berlin, MD 21811. Tel. 410-641-4775. Website? www.berlinchamber.org. Berlin is a Historic Village. An influx of shops, arts, entertainment, and restaurants is making this town a favorite destination for many. Only about 6 or 7 miles from Ocean City, Maryland, it takes no time to get there. Even though from the Delaware Beaches it takes longer, believe me, it is worth it. Pleasantly surprised at how large the Chamber was. 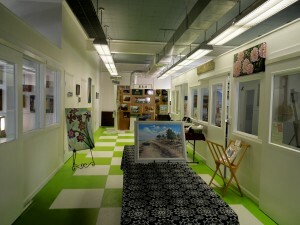 Local artists have studios in this particular building, where you can see them at work. They were not there when we visited but we could still look into their studios. From the Berlin Chamber we crossed the street to see if my friend, Dee, was working, NEST, her store. Dee is one of those shopkeepers that you upon meeting her, you think you have known her forever. Introduction were made and a few pictures taken. 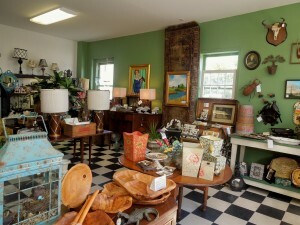 NEST is a boutique, and a gallery, with local art, village treasures, and handmade collectibles. 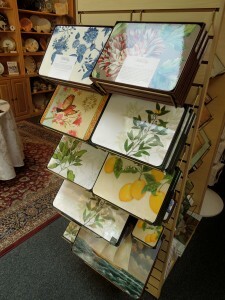 It is located at 11 South Main Street, Berlin, MD 21811. Tel. 410-629-1030. You can also find NEST on Facebook. 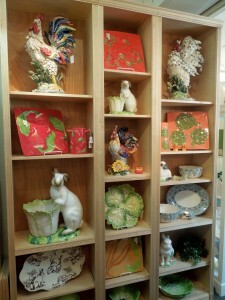 The store looked great and Dee has wonderful things for everyone. Her colorful bags were hanging, displaying unique contrasting fabrics. These bags are made by Dee. We continued with our sightseeing by stopping at the Atlantic Hotel. 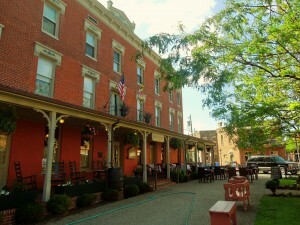 Built in 1895, the Atlantic Hotel is located at 2 North Main St. in downtown Historic Berlin. Tel. 410-641-3589. Website? 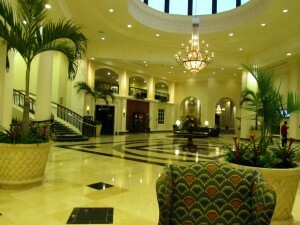 www.atlantichotel.com. Some of the early guests were called “Drummers”, traveling salesmen that crisscrossed the area during the turn of the century. The Hotel plays an integral part in this town. Events, parades, pretty much are centered around it. 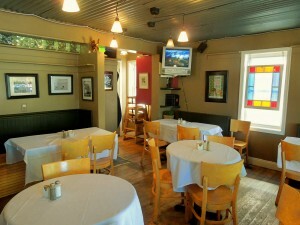 It is open for lunch, dinner, and for special events. 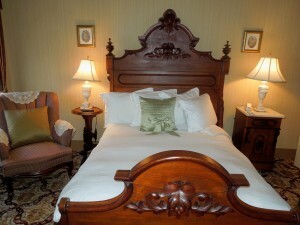 I wrote a post on November 5, 2011 on this historic hotel. Just check my archives. We then continued on our exploration of Berlin even though it was somewhat hot today. 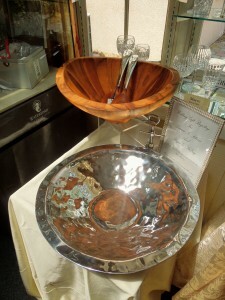 When I first visited Jeffrey Auxer Designs, I was so impressed by this young artist. His craft? 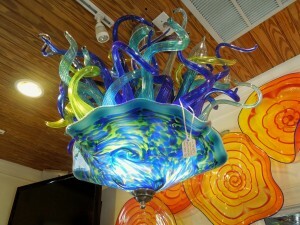 Blown Glass. Jeffrey Auxer Designs is located at 19 Jefferson St. (behind the Atlantic Hotel). Tel. 443-513-4210. Website? www.jeffreyauxer.com. 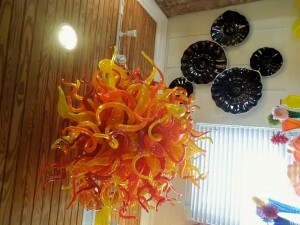 For information on Glass Blowing Classes, please call 443-513-4210. 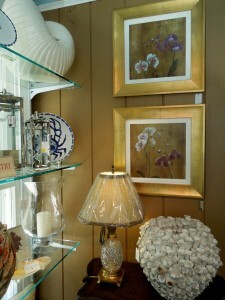 You can find Jeffrey Auxer Designs on Facebook. 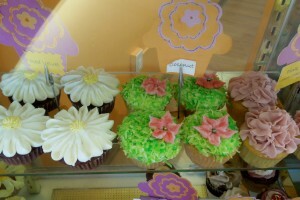 Our next stop was Cupcakes in Bloom. This bakery is located at 120 N. Main St. in Downtown Historic Berlin. Tel. 410-641-9020. You can find Cupcakes in Bloom on Facebook. 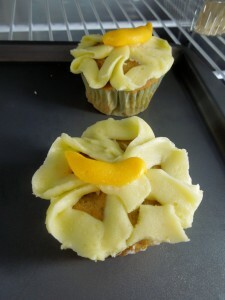 Shawnee is the owner and self taught baker. She is the 2nd place winner of Cupcake Wars. Talented, created and soooo friendly. Talking to Shawnee was fun. You can tell she loves what she is doing. We decided on a carrot and red velvet for me, one that was like a strawberry pretzel salad all in one for Jim, and Basil got I believe one with peanut butter and chocolate, I think. We sat outside and enjoyed every single bite. 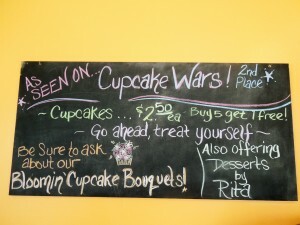 I wrote a post on this bakery on November 2, 2011. Check my Archives. 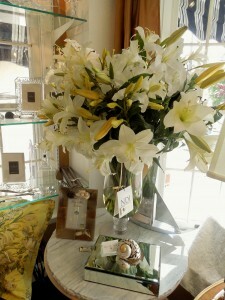 On that post you can see Shawnee’s specialty; the blooming bouquets. A quick stop at the Globe Theater. I did not take any pictures. It is locally owned and operated. Please check their website www.globetheater.com. Their new schedule of events is coming out this week. They serve lunch, dinner and Sunday brunch. And, on their stage thy feature local, regional and national live music. The Globe Theater is located at 12 Broad St. in Downtown Historic Berlin. Tel. 410-641-0784. 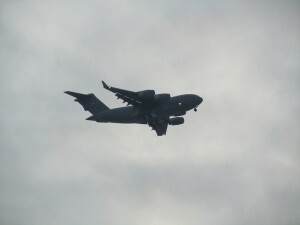 We took off from Berlin, making our way back through Ocean City, Maryland. 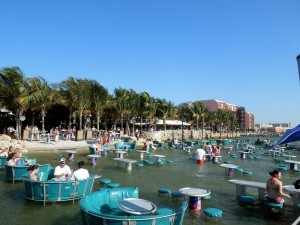 Then, one last stop for my friends to check out Seacrets. 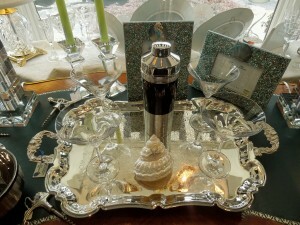 It is located at 117 West 49th St., Ocean City, MD 21842. Tel. 410-524-4900. Website? 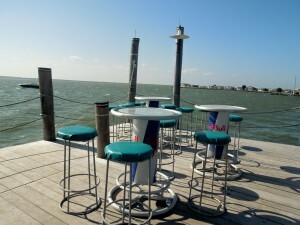 www.seacrets.com. It can be found on Facebook, Twitter and probably any other social media. 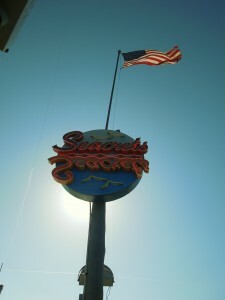 Seacrets is one of those places that you have to see for yourself. It is located on the Bay. 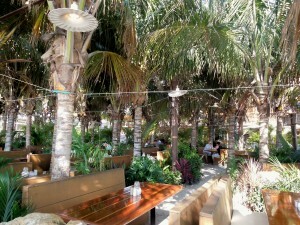 Restaurants, Bars, Beach Bar, and plenty of music and partying. This past week-end the lines to get in were unreal. So, here it is. Now what? There was not way I would be cooking. Hungry hombres at home? You bet!! A friend to join us for dinner? Possibly. 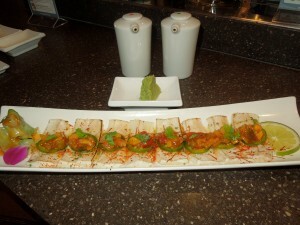 So off we went to Saketumi located at 18814 Highway One, Rehoboth Beach. Tel. 302-645-2818. Kim was there, as usual. Friendly and glad to see us. Tanaka? He was there too and he is amazing. To see him work behind the sushi bar is like watching an artist at work. We had our usuals. I decided to have the seared white tuna tataki with yuzu citrus vinaigrette, accompanied with fresh wasabi. Delicious and light. 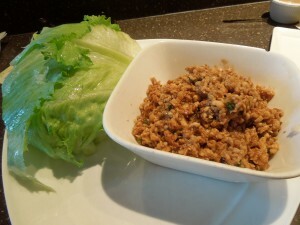 Then, a lettuce wrap followed. I am hooked on these. Ground seasoned chicken so easy to eat and refreshing on a summer day. I think the show is over….I am tired. Talk to you later. Why wait until the Farmers Markets open once a week when you can visit Rustic Acres Farm Market every day? 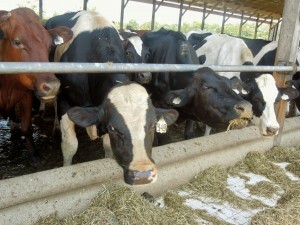 That’s right, as of this week, they will be opening at 11 a.m.
Rustic Acres Farm is the home of Rehoboth Dairy. 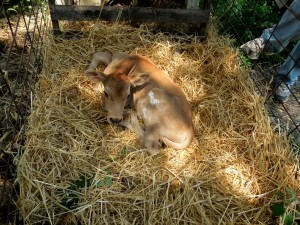 I wrote a post on this farm on January 17, 2012. To see the post with pictures, all you have to do is click on the month of January, 2012, on the left hand of this website, and scroll down to the 17th. Rustic Acres Farm is located at 37217 Rustic Acres Lane, Rehoboth Beach, DE 19971. Just a few miles north of Rehoboth Beach. As you leave Rehoboth Beach, on Rt. 1, take the very next right, Hollands Glade Rd., after Tomato Sunshine. Then, go about 8/10 of a mile. The farm will be on your left. If your are driving south then make a U-turn at the intersection of Shuttle Rd. and Rt. 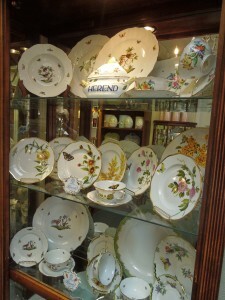 1, then, turn on Hollands Glade Rd., right after Tomato Sunshine. Earl and Mary Ann Warren own this farm. If you have any questions, please call them at 302-245-8308. Ever since I found it, I have been going every week for the best milk, eggs, butter and scrapple, among other things. The milk from their cows is produced, pasteurized and bottled at their dairy and served in the traditional glass bottles. 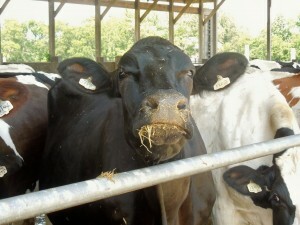 Their livestock is raised in the farm. No antibiotics, or hormones. My friends, Jim and Basil, were in Rehoboth for the week. So, we decided that while all visitors were at the beaches frying themselves in the hot sun, we would take off for the farm. Only a few minutes away from Downtown Rehoboth Beach. Jim surprised me and wore his scrapple t-shirt which was very appropriate since Rustic Acres Farm has great delicious scrapple. 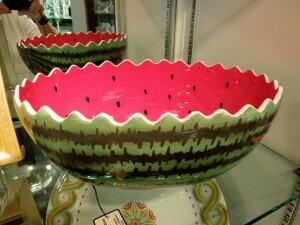 New for this 2012 Summer Season. 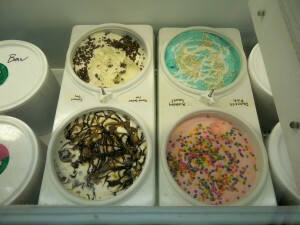 You will find ice cream at the farm. Earl is going to be making a flavor of the week soon. 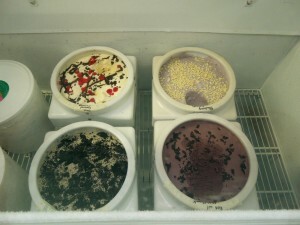 But, the different varieties of ice cream every day come from Chesapeake Bay Farms. This farm is the last remaining farm in Worcester County on Maryland’s Eastern Shore. You can read more about it at www.chesapeakebaycheese.com. Their ice cream is completely void of growth hormones, antibiotics, or chemical compounds. They have very interesting flavors like coconut joy, peanut butter cup, birthday Smurf, princess pink, sweet cream, Bavarian chocolate, beans and cream, and a few more. So there we were, checking the farm over. Mary Ann was going to give us the tour. The first thing we did was to walk over to check some of the cows. 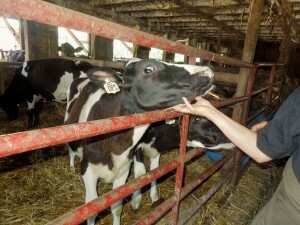 Mary Ann explained the milking process at the farm. We were touching and taking pictures of the cows. 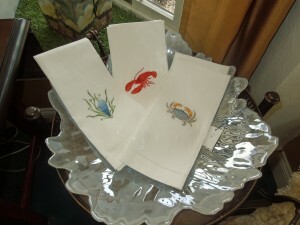 You could not resist them, especially after Mary Ann was calling them by their individual names. 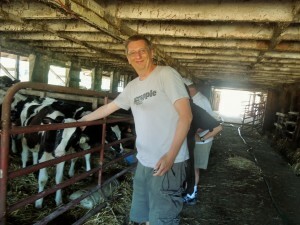 She showed us the milk house, as well. From there we went to see the bigger cows. When one of the bulls came through there was a definite size difference. Gigantic!! 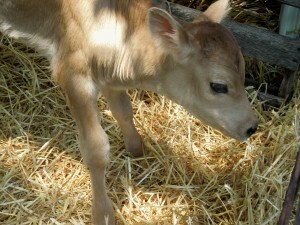 Walking to see a new calf was the highlight of the visit. It had been born the day before. He was just the cutest thing. He finally got up; big legs and clumsy. The longest eyelashes you will ever see. We stayed there awhile, not wanting to leave such a sweet creature. 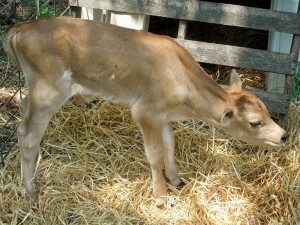 A little older calves got our attention, as well. They were just as beautiful. May Ann and Earl have a full time job taking car of this farm. Their sons help and summer help will be much welcomed soon. We really appreciated the tour; knowing that they usually do not give tours. We left the farm with smiles on our faces and off to Lewes we went, where we walked and tour the Zwaanendael Museum, ate King’s Ice Cream, visited the Ryves Holt House built in 1665, walked around the Lewes Historical Complex, tour the Lighthouse Overfalls, walked by the Cannonball House, drove to the City Dock and by the University of Delaware College of Marine Sciences, and a drive around Rehoboth Country Club where the view of Rehoboth Bay is so nice. A great day for sightseeing!! My evening was not over. 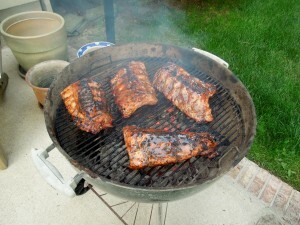 I left marinating my babybacks. 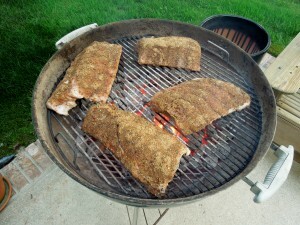 Then, a made up dry rub while the coals were doing their thing. 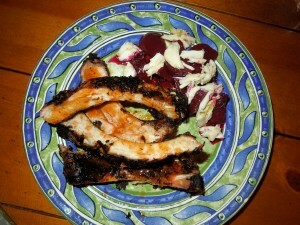 On the grill and served with my own roasted beets, which had been pickled, topped with jumbo lump. 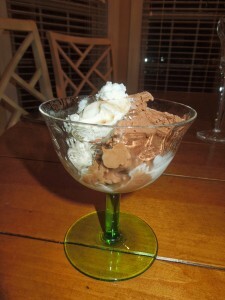 Ice Cream from Rustic Acres Farm….not so fast. It was not for me. It was my husband’s dessert. “The Nation’s Summer Capital” – In 1925 a paved highway was finished between Georgetown and Rehoboth Beach. This helped link Rehoboth to the paved roads towards Washington, D.C. Soon, after that, it was so much easier to get to and from the resort. Diplomats, legislators and government employees made Rehoboth Beach their summer destination. 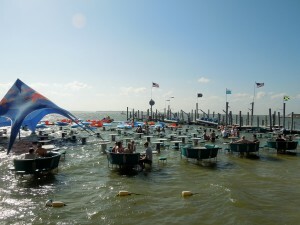 At present, Rehoboth Beach and the surrounding Delaware Beaches are a year-round destination. A way to get out of town, so to speak. This Visitors’ Center in Rehoboth Beach is the easiest to spot. I decided to visit on Thursday because this is no ordinary Visitors’ Center. This charming building was a full fledge train station. It was built in 1879 just after train service was extended to Rehoboth Beach. Travel to the beach was found to be easier, faster, and more comfortable. This is not its original location. It was closer to the ocean on Rehoboth Avenue. In the 1920s, train travel to and from Rehoboth Beach came to a stop. It had always been seasonal, suspended during the winter. In 1927 Rehoboth Avenue was being paved. The Station was stripped of its shed roofs and was moved to a side of Rehoboth Ave. adjoining other buildings. On that spot it continued to function as an express freight and a Western Union Office. Sold in 1950 after all service was ended. 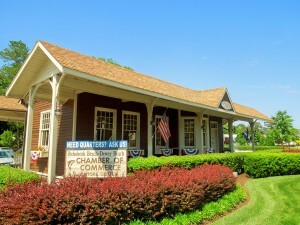 The Station was always remembered as The Railroad Station regardless of which businesses occupied it. In 1987 the Station was moved to this present site at 501 Rehoboth Ave., at Lighthouse Island Park. 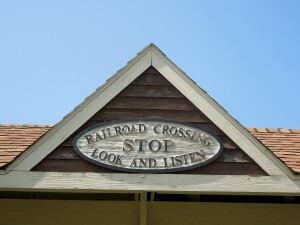 In 1985 the Rehoboth Railroad Station Preservation Society was formed. Members of the Rehoboth Beach Homeowners Association and the Rehoboth Beach-Dewey Beach Chamber of Commerced got to work promptly to restore an important piece of this community’s past. Inside the Visitors’ Center you will find plenty of information to keep you busy during your stay in our coastal village. 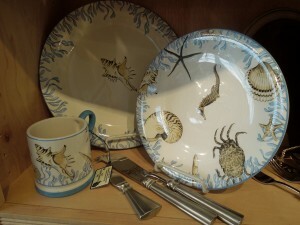 Discounts; remember your Sand Dollar Savings card is available, free of charge. It looks like the inside of a train station; which is really what it was. Old photos of what Rehoboth Beach used to look like will amaze you at how far this town has come; still keeping its integrity. 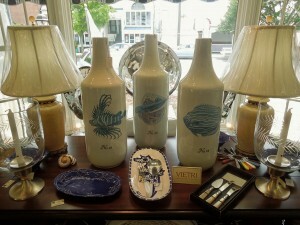 So, make this your first stop as you embark on the enjoyment of everything Rehoboth Beach!! Note: Information for this post was taken from information provided on the brochure of Rails along The Chesapeake, A History of Railroading on the Delmarva Peninsula 1827-1978, John C. Hayman; Marvadel Publishers. 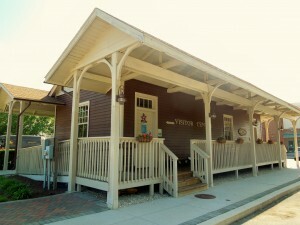 The History of the Rehoboth Railroad Station. 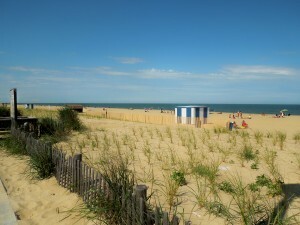 Rehoboth Beach, Delaware, Ready for the Summer of 2012!! Delaware Beaches, Let Summer Begin!! 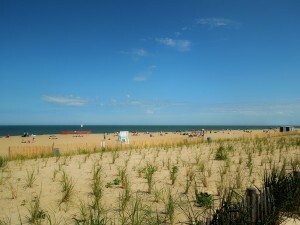 Rehoboth Beach is more than ready for the opening of the 2012 Summer Season. Memorial Week-End starts it all. Downtown Rehoboth Beach looked so pretty today. Last day for all of us that have enjoyed the winter and spring without the worries of parking meters. But, all good things must come to an end. Meters will start tomorrow at 10 a.m. until midnight. Rehoboth Beach is trying to make it easier for its visitors. Many ways in which to pay for parking. The new thing is the Park Mobile. It is supposed to relieve parking stress. I am not sure about that, because first you have to find a space. At the height of the summer season, it is not only stressful, but maddening. Don’t you think? To pay for parking you can use a mobile app, QR Code or call 1-877-727-5758. Once you have found a parking space, launch the free mobile app or call the number above mentioned. Enter the parking zone number located on the meter. It is that easy!! 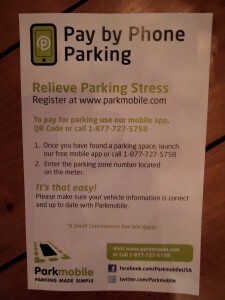 Please visit www.parkmobile.com. On Facebook you can find it as ParkmobileUSA and on Twitter they are found as Parkmobile. It applies to all street meters. You can also still use the good old quarters and there are plenty of change stations along Rehoboth Ave. And, there are parking passes for the day, extended stay and seasonal, as well. 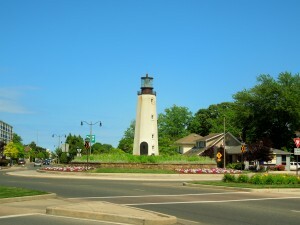 Please visit http://www.cityofrehobothbeach.com. Click on Parking Information. Beach wheels are available for visitors with disabilities from 9 a.m. to 5 p.m. every day. You can located those at Maryland Ave. and the Boardwalk, and at Laurel St. and the Boardwalk. Beach access ramps are located on those streets, as well. Remember that they are on a first come first serve basis. QR Code on the back for scanning with your smart phone. Sand Dollar Savings. 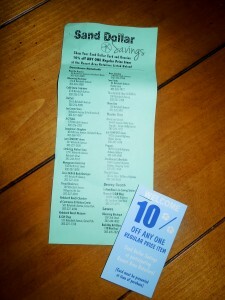 To obtain 10% off any regular price items you need to get your Sand Dollar Card. You need to present the card at time of purchase and it can be used all season. It is free too. 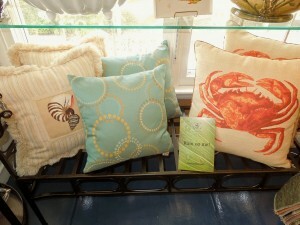 There is a list of participating retailers in Downtown Rehoboth Beach, Route One, Dewey Beach and Lewes. Just stop by at the Visitors’ Center located at 501 Rehoboth Ave., by the roundabout and pick up the card. 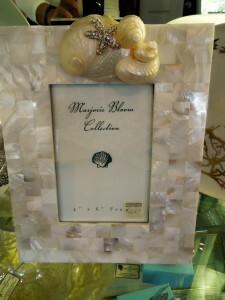 To find retailers, look for the Sand Dollar Decal on the store front doors/windows. You can also scan the QR code with your smart phone for the list of participating retailers. There is an expectation in the air that this summer season will be a spectacular one; even a better one if the weather cooperates, just like it has been all winter and spring. 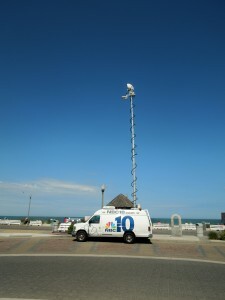 By the Bandstand and Boardwalk I found NBC Channel 10, Philadelphia. I guess they were doing a live broadcast. Looking south on Rehoboth Beach was looking good. Looking north was just as pretty. 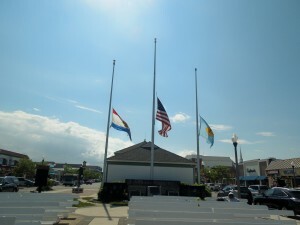 And, then, I looked at the Flags at half mast…..is more than the 2012 Opening of the Summer Season. What was I thinking? 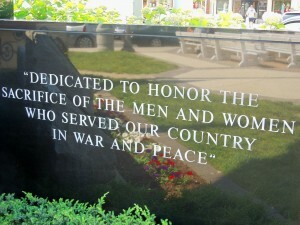 It is Memorial Week-End. I am sure some of you, especially, my friends would like to ask me why am I writing a post on Dover when I should be concentrating at the Delaware Beaches. 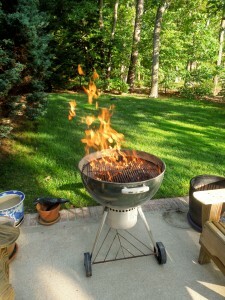 After all, opening the 2012 Summer Season, should be the most important post; where to go, what to do, where to eat, etc. etc. I’ll get there, don’t worry. In the meantime, let me tell you about Dover. Yes, our state’s Capital. I thought I have found the neatest museum. Come to think of it, the museum is 20 years old. It is called the Biggs Museum of American Art. In order to get there, you might want to know a few facts about Dover, Delaware. I know, that DuPont Highway is not very pretty; one fast food place after another. It is incredible how many. Years ago a by-pass was built so in reality unless you have business to do in Dover, you probably will not even stop. Hopefully, this might entice you to give it a second look. Dover was founded in 1683. 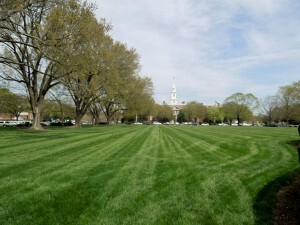 If you go a few streets back you will find The Green, right in the Capital Complex & Historic District. It is a central square and was the location of many rallies, troop reviews and patriotic events. 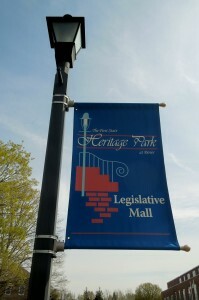 It is the heart of the Historic District and the location of the Delaware Supreme Court and the Kent County Courthouse. Dover is the home of the Dover Air Force Base. It is also the U.S. military’s only mortuary in the continental U.S., which accepts and processes the remains of soldiers killed in battle. A company named ILC Dover, just a few miles south, in the area known as Frederica, has been the producer of fabrics for military and aerospace uses. 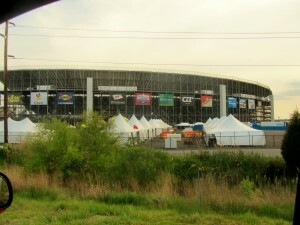 NASCAR Races are held at Dover International Speedway, home of the Monster Mile. At Dover Downs Hotel & Casino, you will find gambling and harness racing, both simulcast and live. The list goes on an on with various museums, universities, parks, and rivers in the area. I had to get something notarized and it had to be in Dover. Long story; boring. As I was coming out of the building I look and saw the museum. It is called the Biggs Museum of American Art. It is located at 406 Federal Street, Dover, DE 19901. Tel. 302-674-2111. Website? www.biggsmuseum.org. You can find it on Facebook, as well. 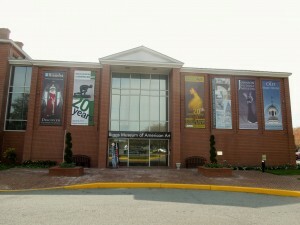 The Biggs Museum of American Art opened in 1993. 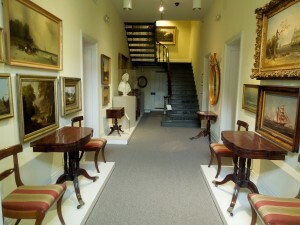 It was founded to display the art collection of its founder, Sewell C. Biggs. It is one of many sites within the First State Heritage Park, which is in downtown Dover, in the historic district. 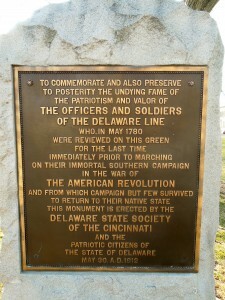 The First State Heritage Park is Delaware’s first urban “park without boundaries” linking historic and cultural sites in the city that has been the seat of state government since 1777. There is a Welcome Center at 121 Duke of York Street, where you can get more information. From the Delaware Beach Resorts all you have to do is take Route 1 North towards Dover. Make a slight left at Clapman Rd. Continue on to South State St. into Dover. Make a right at North Street. Museum is located on the right at the first stop sign. It will probably take you about 45 minutes. Admission to the museum is free for all ages. There might be fees for special events, programs and workshops, though. It is an easy museum to navigate. Relaxing too. You can explore the permanent collections. 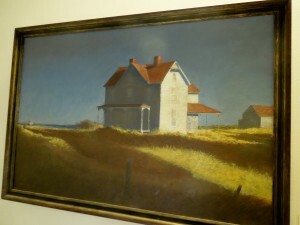 American paintings collections, art forms as sculptures and images by Brandywine School illustrator, Frank E. Schoonover. 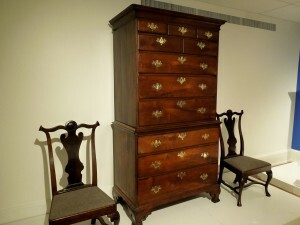 The furniture by early American cabinetmakers is gorgeous. 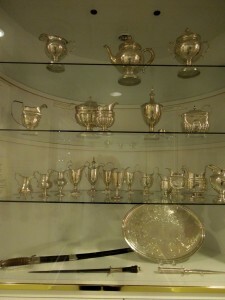 The Museum’s Delaware Silver Study Center holds one of the finest collections of regional silver in the country. 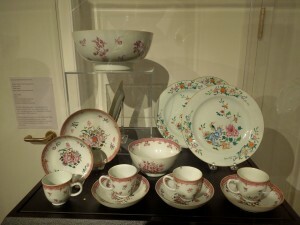 Until June 24th a very important exhibit is presently at the Museum. It is called Jewels of the Generations. 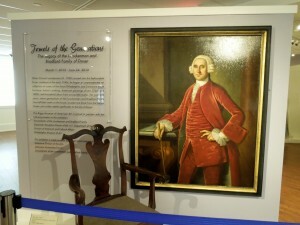 It is the Legacy of the Loockerman and Bradford Family of Dover. Vincent Loockerman died in 1785. 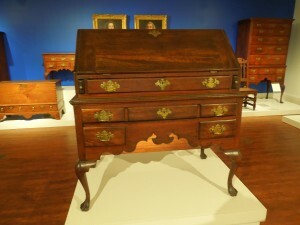 From what I read, it is said that he was probably Dover’s single largest land owner and collector of Delaware and Philadelphia made furniture of the 18th century. 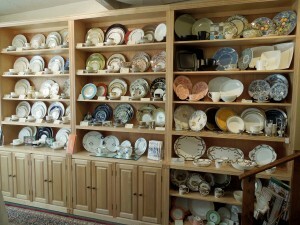 His family has added over the years to that collection. 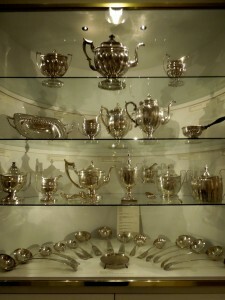 The Museum’s founder, Sewell C. Biggs, was a collector and admirer of the objects accumulated by Vincent Loockerman. 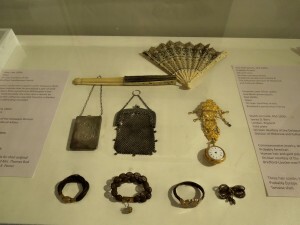 The exhibit, on loan, also has early American clothing, Victorian jewelry, American and European silver, American portraits, and Delaware and Philadelphia furniture. This is a very active Museum. 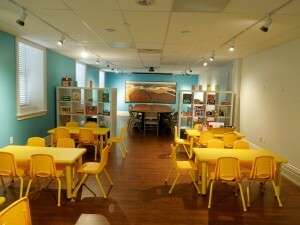 The Children’s Sewell’s Studio is a public interactive art studio. It is used for lectures, workshops, birthday parties and meetings. The 2 rifles caught my attention. 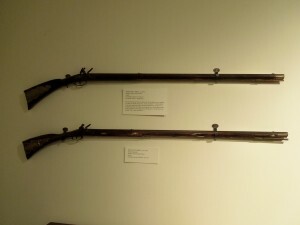 They were Kentucky rifles; examples of where we get the term “lock, stock and barrel”. All the pieces were made separately before being assembled into a rifle. 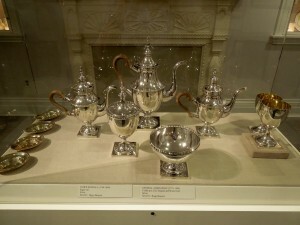 They were made in Berks County, PA. ca 1830 and 1800. These caught my attention, as well. The miniature Chest of Drawers, probably made in Delaware, painted wood. Late 19th or early 20th century. 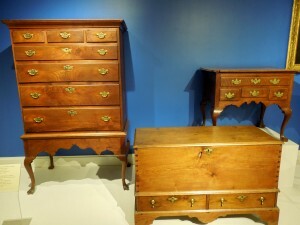 The Blanket Chest also from Delaware is painted yellow pine. Ca 1790-1810. 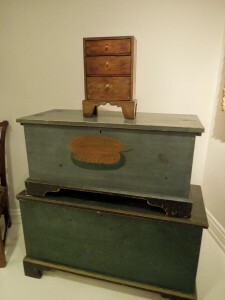 And, the botton is also a Blanket Chest, CA 1800-1825, painted poplar and made in Sussex County. 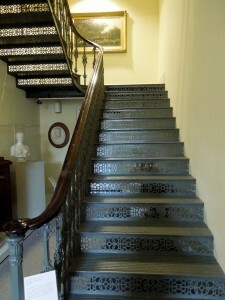 This picture shows a staircase, ca 1850 made in cast iron, probably in Philadelphia. It is original to the Museum. This part of the Museum was used as a Delaware State Office building in the 19th century. 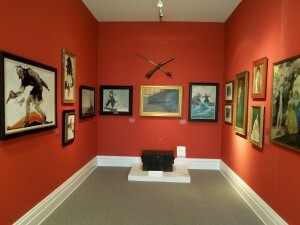 In this particular Gallery every painting was made by Frank E. Schoonover, many of them as illustrations for books like Robin Hood and King Arthur and His Knights. It is painted in red because that’s the color that he included in all of his paintings. 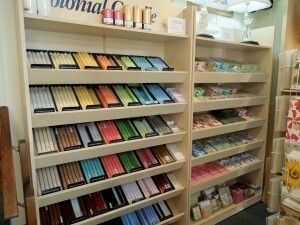 Delaware by Hand (DBH) is the brand of the artist and artisan members of the Biggs Museum of American Art. 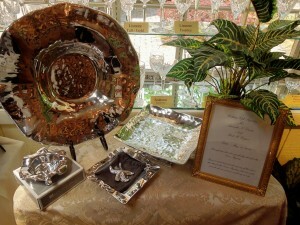 This coming Saturday, 5/26 at the Zwaanendael Park in Lewes, Delaware, it is the Member’s Day Show featuring unique and original artworks for sale, from 50 vendors. 10 a.m. to 4 p.m. Free admission. 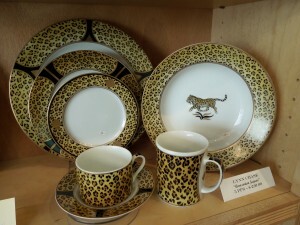 There is also a Retail Gallery at the Biggs Museum which opens Tuesdays through Saturdays from 9:30 a.m. until 4:30 p.m. Saturdays from 1:30 p.m. until 4:30 p.m. 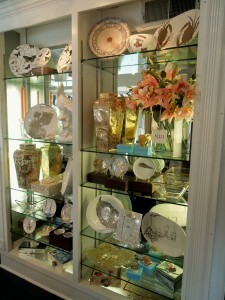 It features a rotating selection of arts and fine crafts by DBH artist member of the Biggs. 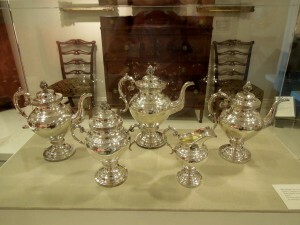 Please check the website, www.biggsmuseum.org, for events, tickets, and information, like First Friday, which will be on June 1st where there will be a Delaware by Hand Trunk Show from 5 to 7 p.m. at the Biggs. On Saturday, 6/9 Winescapes: Unplugged and Uncorked with Paul Cullen from 5 to 7 p.m. An evening of contemporary jazz. $35. This is one of those jewels that are found just in your backyard….too crowded at the beach? Then head north. Just 45 minutes away. 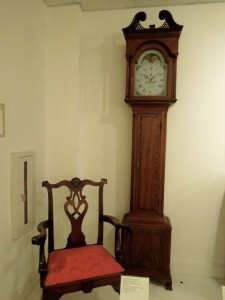 They have a beautiful collection of Tall Clocks, as well. Note: Information for this post was taken from Wikipedia, and Biggs Museum of American Art. Just a few days ahead is the “official” opening of the Delaware Beaches. With that comes the enjoyment of our parks and recreations. Cape Henlopen State Park has wonderful activities for the whole family. In order to enter the Park you need to pay an entry fee or you can buy a pass and use it all year. 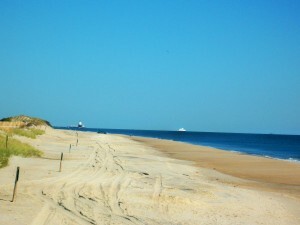 For more information on passes and entry fees to the Delaware State Parks, please visit http://www.destateparks.com/fees/entry/index.asp. Also, Cape Henlopen State Park has great summer programs, once those kids get bored after being home for a week or so. 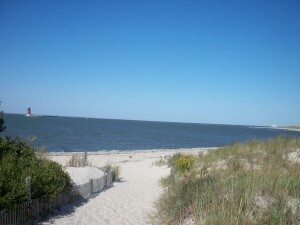 Visit http://www.destateparks.com/park/cape-henlopen and click on Summer Camps 2012. And, if you want to check the ospreys that inhabit Cape Henlopen State Park please visit the web cam at http://www.destateparks.com/park/cape-henlopen. Click on Osprey Cam. New for 2012: The Southern Delaware Botanic Gardens is an all volunteer, grass-roots organization dedicated to creating world-class botanical gardens that inspire and educate. Their website, www.delawaregardens.org, is under construction at the moment. In the meantime, you can Like them on Facebook. 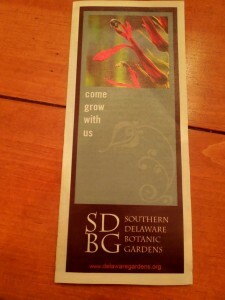 Search for Southern Delaware Botanic Gardens. 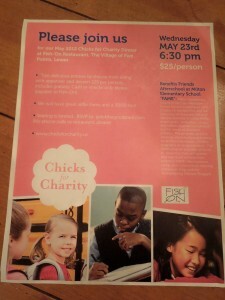 Wednesday, 5/23 – Chicks for Charity Dinner at Fish-On Restaurant located at the Village of Five Points in Lewes. It will benefit Friends Afterschool at Milton Elementary School “FAME”. Milton Elementary School in the Cape Henlopen School District is partnered with Children & Families First and the University of Delaware Office of Service Learning to create FAME, a non-profit, innovative unique and holistic approach to addressing the needs of all school children. FAME provides activities to maximize their self-esteem and help them achieve their potential. They also offer summer camps, after school clubs, tutoring homework help, and the Strengthening Families Program. Chicks for Charity was founded by Kari Ainsworth and Marci Urgo. It is a group dedicated to assisting those less fortunate. It was established in Lewes, Delaware. They have aided the residents of Sussex County since its inception. Many of the charitable organizations they have helped are essential community resource agencies. Dinner on Wednesday at Fish On will start at 6:30 p.m. Two delicious entrees to choose from along with appetizer and dessert. $25 per person includes gratuity. Cash or checks only payable to Fish-On. Cash Bar available. There will be a 50/50 raffle too. Please RSVP to gals4thegood@aol.com. Please, do not call the restaurant. Check what Chicks for Charity are all about at www.chicksforcharity.us. Guess what? Guys are invited too. Don’t be shy!! Thursday, 5/24 – Children’s Beach House Golf Classic – One Day, One Course, One Cause. Kick off the Summer Season while participating in this event that will take place in the beautiful Peninsula on Indian River Bay Golf Course. You can call 302-645-9184 to register or go on line at http://www.cbhinc.org/events/cbh-golf-classic.html. Friday, 5/25 – Lightship Overfalls Opening Party & Auction – 6:30 p.m. until 9:00 p.m. This is the official gala kickoff of the Lightship Overfalls’ season. Fun, food and prizes for all!! Location: Virden Retreat & Conference Center, University of Delaware Lewes Campus on Pilottown Rd. This event is a major fundraiser in order to help support the Lightship Overfalls and its programs. 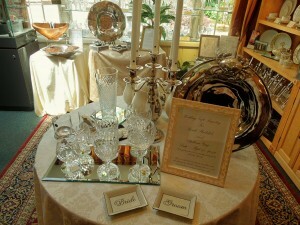 Tickes are available in advance, online, at http://www.overfalls.org/events/2012_5_25_opening_party.html. They can also be purchased at Lewes Gourmet Puzzles, Kids Ketch, Lewes Chamber or by contacting Evelyn Kyritsis at 302-645-7168. Lightship Overfalls is one of only 17 remaining lightships out of a total of 179 built from 1820 – 1952. It was designated as a National Historic Landmark in 2011. 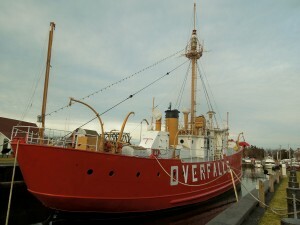 It is also one of 7 lightships still open to the public in the U.S. Visit www.overfalls.org for more information. 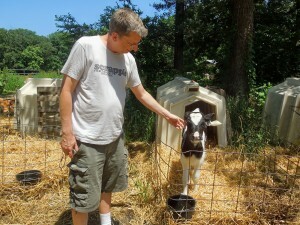 Saturday, 5/26 – 9/22 – It is the Historic Lewes Farmers’ Market 2012 Opening Season. 8 a.m. until Noon. Every Saturday. Location? Lewes Historical Society Complex at 110 Chipcarpenter Street in downtown Lewes. Note: There are 3 dates when the market will be held at Shields Elementary in Lewes: June 23rs, July 14th and August 4th. More info? 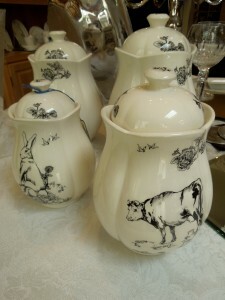 Please visit http://www.historiclewesfarmersmarket.org. 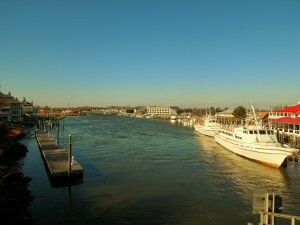 Sunday, 5/27 – Yoga with Dimitra at Canalfront Park from a.m. until 9 a.m., located at 211 Front St. in Historic Lewes. Bring your own mat or towel. More info? www.dimitrayoga.com. Also found on Facebook. More info on Canalfront Park can be found at www.lewescanalfrontpark.org. Sunday, 5/27 – If you are a history buff, a veteran, or interested in learning about the Delaware Shore and WWII, then this might be just up your alley. Lantern Tour of Fort Miles will be on this coming Sunday from 7:30 p.m. until 9:30 p.m. Tour the gun battery by lantern light and learn how soldiers defended our coast. It is for ages 10 and up with an adult. It is also limited to 30 people. Pre-registration is a must and it is required. $5 per person. Call 302-645-6852 to register and for more info. Fort Miles is inside Cape Henlopen State Park. Fort Miles was a key piece in the nation’s coastal defense during WWII. In April of 2005 it was added to the National Register of Historic Places. 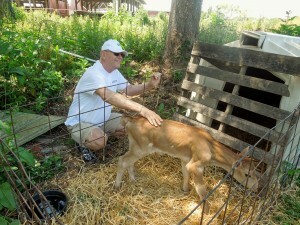 For more info., please visit http://www.destateparks.com/attractions/fort-miles/index.asp. Have a great week. Please note that AboutMyBeaches is on Facebook. LIKE it if you think is providing you with the info. you are interested in. Or, give suggestions for improving. Also on Twitter. 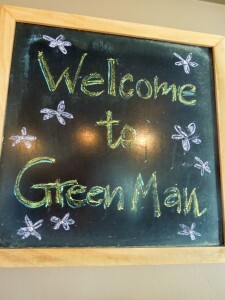 Finally, Jody and I were able to make it to GreenMan. Can’t wait for this very popular breakfast and lunch spot to open every day. 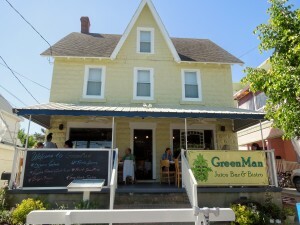 At the moment GreenMan is opening Thursdays through Sundays from 8 a.m. until 4 p.m.
GreenMan Juice Bar & Bistro is located at 12 Wilmington Ave., right on the ocean block. Tel. 302-227-4909. Keep that number because you can order take-out, including whole quiches, as well. 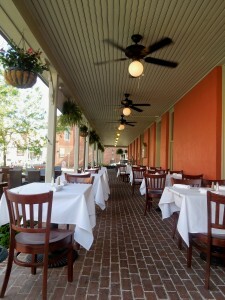 Some of the Rehoboth Beach restaurants are located in old “cottages” that give them character and distinction. 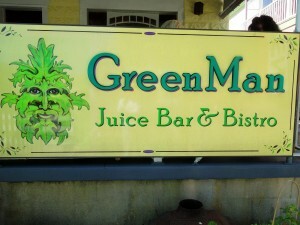 GreenMan is one of such restaurants. It has been spruced up to tackle another summer season at the Delaware Beaches. The porch at GreenMan is sought after. 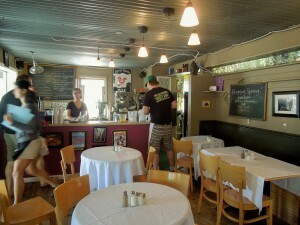 The restaurant is small; inside tables and a small ordering bar. 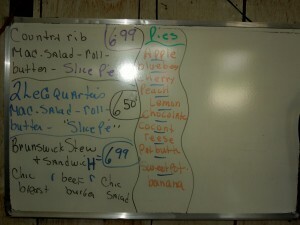 There are blackboards mentioning the daily offerings, besides their menu. The staff is friendly and some have been there a long time. I wanted to order a shot of their wheat grass. I feel that when I come to GreenMan I need to be eating as healthy as possible. On that particular day they did not have it so I decided to get the Super Juice. 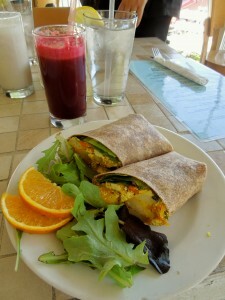 It had carrot, apple, spinach and beets. I love beets and that was the primary taste on this very colorful juice. I think Jody had either the Hawaiian Escape or the Strawberry Seduction. I can’t remember, but definitely bananas were the primary fruits. 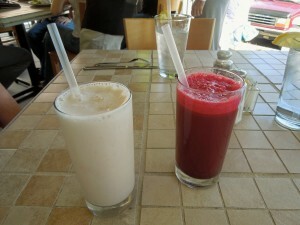 You can tell by the color of our juices which one was hers and which was mine. 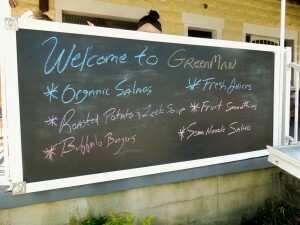 Throughout the day GreenMan serves gourmet sandwiches, salads, homemade soups, quiches, and burgers. 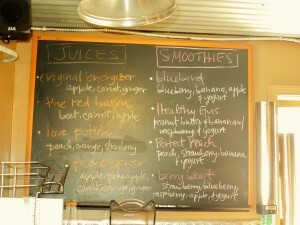 Teas, smoothies and organic drinks are always favorites. Jody decided on a tomato and spinach quiche. Always popular the quiches go quickly. 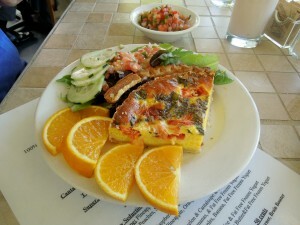 You can also order whole quiches to take home. I decided to have a tofu and potato wrap. If you think that was boring; think twice. Delicious and perfectly seasoned. 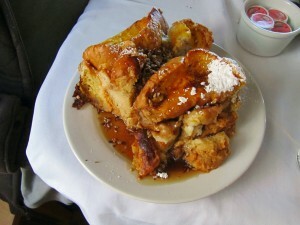 One day, I am not kidding, I am going to have their Creme Brulee French Toast…..as soon as I decide I want to gain weight…I will do that. It is one of their most photographed offerings.